This study analyses the relationship between urban planning and mobility, focusing on the surroundings of Alicante high-speed rail station, using the TOD (Transit-Oriented Development) model. 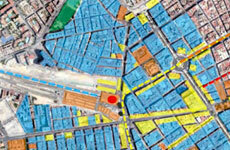 In practice, the research covers an area within a radius of 500 metres from the high-speed rail station. TOD standard focuses on a shared vision on urban development and transport planning, with the aim of maximising the benefits of public transport while considering the broader emphasis on users. Besides, it provides a new quantitative value on the area to be assessed and also on the existing urban potential by means of descriptive parameters. Furthermore, careful planning together with land-use design are essential to enhance and value not only public transport but also pedestrians and cyclists. The study concludes with a number of key points which could serve as a basis for improving the area, with a special focus on reducing the use and predominance of private vehicles, as well as on giving priority to pedestrians and cyclists in order to optimise the socio-economic potential of the high-speed station and its surroundings.